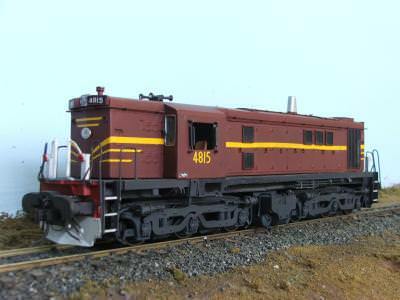 The NSWGR 48 class diesel electric locomotive was part of a total of 212 Goodwin Alco DL531 locomotives built from the late 1950s onwards. Significant numbers are still in regular use in New South Wales and South Australia. The kit was a joint venture between O-Aust Kits and Bergs Hobbies. The model consists of pewter, lost wax and polyurethane castings. All four versions are available. The current mechanism is powered on all axles by a Northwest Shortline 2940 can motor. A new mechanism featuring self contained powered bogies is planned for future release.